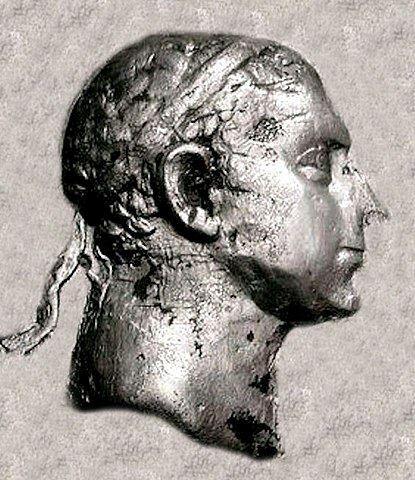 Pantaleon was a Greek king who reigned some time between 190–180 BC in Bactria and India. He was a younger contemporary or successor of the Greco-Bactrian king Demetrius, and is sometimes believed to have been his brother and/or subking. The scarcity of his coinage indicates a short reign. Known evidence suggests that he was replaced by his (probable) brother or son Agathocles, by whom he was commemorated on a "pedigree" coin. He was the first Greek king to strike Indian coins, peculiar irregular bronzes representing a lion with a dancing Indian woman, probably the goddess Lakshmi (a type also known in the Post-Mauryan coinage of Gandhara), which suggests he had his base in Arachosia and Gandhara and wanted support from the native population. Some of his coins were made of copper-nickel alloy, a technology that would not be developed in the West until the 18th century, but was known by the Chinese at the time.